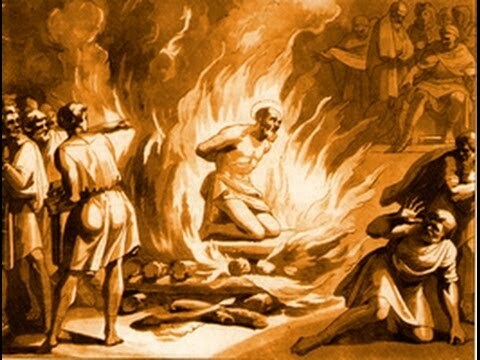 Polycarp, born about a.d. 69 or earlier, a disciple of the apostle John, a younger friend of Ignatius, and the teacher of Irenaeus (between 130 and 140), presided as presbyter-bishop over the church of Smyrna in Asia Minor in the first half of the second century; made a journey to Rome about the year 154, to adjust the Easter dispute; and died at the stake in the persecution under Antoninus Pius a.d. 155, at a great age, having served the Lord six and eighty years. He was not so original and intellectually active as Clement or Ignatius, but a man of truly venerable character, and simple, patriarchal piety. His disciple Irenaeus of Lyons (who wrote under Eleutherus, 177–190), in a letter to his fellow-pupil Florinus, who had fallen into the error of Gnosticism) has given us most valuable reminiscences of this "blessed and apostolic presbyter," which show how faithfully he held fast the apostolic tradition, and how he deprecated all departure from it. He remembered vividly his mode of life and personal appearance, his discourses to the people, and his communications respecting the teaching and miracles of the Lord, as he had received them from the mouth of John and other eye-witnesses, in agreement with the Holy Scriptures. 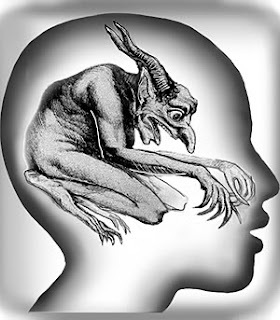 In another place, Irenaeus says of Polycarp, that he had all the time taught what he had learned from the apostles, and what the church handed down; and relates, that he once called the Gnostic Marcion in Rome, "the first-born of Satan." This is by no means incredible in a disciple of John, who, with all his mildness, forbids his people to salute the deniers of the true divinity and humanity of the Lord; and it is confirmed by a passage in the epistle of Polycarp to the Philippians, where he says: "Whoever doth not confess, that Jesus Christ is come in the flesh, is antichrist, and whoever doth not confess the mystery of the cross, is of the devil; and he, who wrests the words of the Lord according to his own pleasure, and saith, there is no resurrection and judgment, is the first-born of Satan. Therefore would we forsake the empty babbling of this crowd and their false teachings, and turn to the word which hath been given us from the beginning, watching in prayer, continuing in fasting, and most humbly praying God, that he lead us not into temptation, as the Lord hath said: 'The spirit is willing, but the flesh is weak.' "
This epistle to the Philippians consists of fourteen short chapters, and has been published in full since 1633. It is the only, document that remains to us from this last witness of the Johannean age, who wrote several letters to neighboring congregations. It is mentioned first by his pupil Irenaeus; it was still in public use in the churches of Asia Minor in the time of Jerome as he reports; and its contents correspond with the known life and character of Polycarp; its genuineness there is no just reason to doubt. It has little merit as a literary production, but is simple and earnest, and breathes a noble Christian spirit, It was written after the death of Ignatius (whose epistles are mentioned, c. 13) in the name of Polycarp and his presbyters; commends the Philippians for the love they showed Ignatius in bonds and his companions, and for their adherence to the ancient faith; and proceeds with simple, earnest exhortation to love, harmony, contentment, patience, and perseverance, to prayer even for enemies and persecutors; also giving special directions for deacons, presbyters, youths, wives, widows, and virgins; with strokes against Gnostic Docetic errors. Of Christ it speaks in high terms, as the Lord, who sits at the right hand of God to whom everything in heaven and earth is subject; whom every living being serves; who is coming to judge the quick and the dead; whose blood God will require of all, who believe not on him. Polycarp guards with sound feeling against being considered equal with the apostles: "I write these things, brethren, not in arrogance, but because ye have requested me. For neither I, nor any other like me, can attain the wisdom of the blessed and glorious Paul, who was among you, and in the presence of the then living accurately and firmly taught the word of truth, who also in his absence wrote you an epistle, from which ye may edify yourselves in the faith given to you, which is the mother of us all, hope following after, and love to God and to Christ, and to neighbors leading further. For when any one is full of these virtues, he fulfills the command of righteousness; for he, who has love, is far from all sin." This does not agree altogether with the system of St. Paul. But it should be remembered that Polycarp, in the very first chapter, represents faith and the whole salvation as the gift of free grace. The epistle is interwoven with many reminiscences of the Synoptic Gospels and the epistles of Paul, John and First Peter, which give to it considerable importance in the history of the canon. The Martyrium S. Polycarpi (22 chs. ), in the form of a circular letter of the church of Smyrna to the church of Philomelium in Phrygia, and all "parishes of the Catholic church," appears, from ch. 18, to have been composed before the first annual celebration of his martyrdom. Eusebius has incorporated in his church history the greater part of this beautiful memorial, and Ussher first published it complete in the Greek original, . It contains an edifying description of the trial and martyrdom of Polycarp, though embellished with some marvellous additions of legendary poesy. When, for example, the pile was kindled, the flames surrounded the body of Polycarp, like the full sail of a ship, without touching it; on the contrary it shone, unhurt, with a gorgeous color, like white baken bread, or like gold and silver in a crucible, and gave forth a lovely fragrance as of precious spices. Then one of the executioners pierced the body of the saint with a spear, and forthwith there flowed such a stream of blood that the fire was extinguished by it. The narrative mentions also a dove which flew up from the burning pile; but the reading is corrupt, and Eusebius, Rufinus, and Nicephorus make no reference to it. The sign of a dove (which is frequently found on ancient monuments) was probably first marked on the margin, as a symbol of the pure soul of the martyr, or of the power of the Holy Spirit which pervaded him; but the insertion of the word dove in the text suggests an intended contrast to the eagle, which flew up from the ashes of the Roman emperors, and proclaimed their apotheosis, and may thus be connected with the rising worship of martyrs and saints. Polycarp and the presbyters with him to the congregation of God which sojourns at Philippi. Mercy and peace be multiplied upon you, from god almighty, and from Jesus Christ our Savior. 1. "I have greatly rejoiced with you in the joy you have had in our Lord Jesus Christ, in receiving those examples of true charity, and having accompanied, as it well became you, those who were bound with holy chains [Ignatius and his fellow-prisoners]; who are the diadems of the truly elect of God and our Lord; and that the strong root of your faith, spoken of in the earliest times, endureth until now, and bringeth forth fruit unto our Lord Jesus Christ, who suffered for our sins, but whom God raised from the dead, having loosed the pains of Hades [Acts 2:24]; in whom though ye see Him not, ye believe, and believing rejoice with joy unspeakable and full of glory [I Pet. 1:8]; into which joy many desire to enter; knowing that by grace ye are saved, not by works [Eph. 2:8, 9], but by the will of God through Jesus Christ. 2. "Wherefore, girding up your loins, serve the Lord in fear [1 Pet. 1:13] and truth, as those who have forsaken the vain, empty talk and error of the multitude, and believed in Him who raised up our Lord Jesus Christ from the dead, and gave him glory [1 Pet. 1:21], and a throne at His right hand [comp. Heb. 1:3; 8:1; 12:2]; to whom all things in heaven and on earth are subject. Him every spirit serves. His blood will God require of those who do not believe in Him. But He who raised Him up from the dead will raise up us also, if we do His will, and walk in His commandments, and love what He loved, keeping ourselves from all unrighteousness, covetousness, love of money, evil-speaking false-witness; not rendering evil for evil, or reviling for reviling [1 Pet. 3:9]; or blow for blow, or cursing for cursing, remembering the words of the Lord Jesus [comp. Acts 20:35] in His teaching: Judge not, that ye be not judged; forgive, and it shall be forgiven unto you; be merciful, that ye may obtain mercy; with what measure ye mete, it shall be measured to you again [Matt. 7:1, 2; Luke 6:36–38], and once more, Blessed are the poor, and those that are persecuted for righteousness' sake, for theirs is the kingdom of God [Luke 6:20; Matt. 5:3, 10]. 3. "These things, brethren, I write to you concerning righteousness, not because I take anything on myself, but because ye have invited me thereto. For neither I, nor any such as I, can come up to the wisdom of the blessed and glorified Paul. He, when among you, accurately and steadfastly taught the word of truth in the presence of those who were then alive; and when absent from you, he wrote you a letter, which, if you carefully study, you will find to be the means of building you up in that faith which has been given you, and which, being followed by hope and preceded by love towards God, and Christ, and our neighbor, is the mother of us all [Gal. 4:26]. For if any one be inwardly possessed of these graces, be has fulfilled the command of righteousness, since he that has love is far from all sin. 4. "But the love of money is a beginning of all kinds of evil, [1 Tim. 6:10]. Knowing, therefore, that as we brought nothing into the world, so we can carry nothing out, [1 Tim. 6:7], let us arm ourselves with the armor of righteousness; and let us teach, first of all, ourselves to walk in the commandments of the Lord. 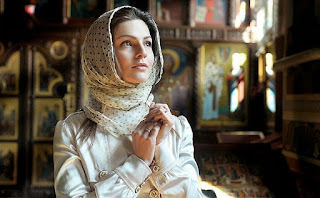 Next teach your wives to walk in the faith given to them, and in love and purity tenderly loving their own husbands in all truth, and loving all equally in all chastity; and to train up their children in the knowledge and fear of God [comp. Eph. 6:11, 13, 14]. Let us teach the widows to be discreet as respects the faith of the Lord, praying continually for all, being far from all slandering, evil-speaking, false-witnessing, love of money, and every kind of evil; knowing that they are the altar of God, that He clearly perceives all things, and that nothing is hid from Him, neither reasonings, nor reflections, nor any one of the secret things of the heart." When the Proconsul demanded that Polycarp should swear by the genius of Caesar and renounce Christ, he gave the memorable answer: "Eighty and six years have I served Christ, nor has He ever done me any harm. How, then, could I blaspheme my King who saved me?" Standing at the stake with his hands tied to the back, as the fagots were kindled, Polycarp lifted up his voice and uttered this sublime prayer as reported by disciples who heard it: "Lord God Almighty, Father of Thy beloved and blessed Son, Jesus Christ, through whom we have received the grace of knowing Thee; God of angels and powers, and the whole creation, and of the whole race of the righteous who live in Thy presence; I bless Thee for deigning me worthy of this day and this hour that I may be among Thy martyrs and drink of the cup of my Lord Jesus Christ, unto the resurrection of eternal life of soul and body in the incorruption of the Holy Spirit. Receive me this day into Thy presence together with them, as a fair and acceptable sacrifice prepared for Thyself in fulfillment of Thy promise, O true and faithful God. Wherefore I praise Thee for all Thy mercies; I bless Thee, I glorify Thee, through the eternal High-Priest, Jesus Christ, Thy beloved Son, with whom to Thyself and the Holy Spirit, be glory both now and forever. Amen."